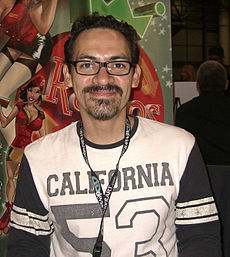 Humberto Ramos is comic book penciller and cover artist, best known for his work on American comic books such as Impulse, The Spectacular Spider-Man, The Amazing Spider-Man and his creator-owned series Crimson. Ramos began his career in 1993 at Milestone Media. He was later hired by DC Comics as the regular penciller for their Flash spin-off Impulse. Since then he has drawn on The Spectacular Spider-Man, which earned him anomination for the Harvey Award for Best Cover artist , created and owned the six-issue miniseries Revelations, and penciled for Wolverine. Additionally, he pencils regularly for The Amazing Spider-Man.